Arkon's SM220 flexible gooseneck windshield suction mount is a favorite in Europe and the United States. The 9 inch long windshield suction pedestal features an 64mm suction base, and provides maximum hold from the windshield. A circular adhesive console / dash disc is also included. It allows you to attach the windshield pedestal to other areas in the vehicle such as the dash or console. Simply stick the adhesive disc in the location where you want to hold your phone and then attach the windshield suction to the flat surface on the disc. Using the adhesive is optional though as most people choose the windshield mount installation. Also included is a Swivel Air Vent Pedestal. This bundle gives you far more mounting options than any other solution. 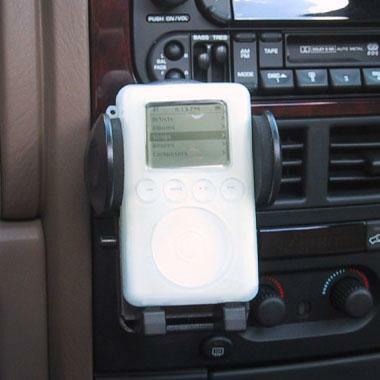 The iPod windshield suction mount and vent mount are both fully case compatible and will work with all models of iPod including the iPod mini and iPod nano. Perfect match for all skin cases.